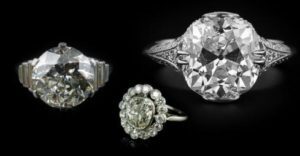 There are a plethora of websites that offer diamond education about the 4C’s: color, clarity, cut, and carat weight (like the Gemological Institute of America). However a 4 C’s education does not tell a person everything they need to know about diamonds, nor does it give advice on what to look for. Thus instead of bombarding our clients with information we have decided to share some opinions and advice on how to intelligently buy diamonds. First and foremost: buy a diamond that is pretty! When buying a diamond, it is essential to look at multiple options and choose the one that “speaks” to you. Too often we get bogged down in analyzing the GIA report of the diamond and we forget that even flawless diamonds can be ugly. But since we know that the grade of the diamond matters, especially for price, we have listed the 4C’s below with a few pointers on what to look for and where we think you should allocate your budget. Cut: despite what most people say, the color and clarity of a diamond is not as important as the cut. A phenomenal cut can hide flaws in a diamond, can make a stone look whiter, and is the single factor that dictates how sparkly the diamond will be. GIA graded “excellent” cuts get that grade because the critical angles and proportions of the stone are all within a narrow range that results in superior light performance (how well a diamond takes light and reflects it back out). That being said, some of the best round diamonds I have ever seen have only received a “good” cut grade from the GIA because the top of the stone (the table) is technically too wide. I happen to like wider- 58-62%- tables because they tend to have lots of flash (sparkles when the light hits it) and a little less scintillation (blue and orange flashes seen when light hits the stone). In my experience clients choose the GIA excellent cut only about half of the time. This is just proof that you need to see the diamond to know what you will prefer. Within the “cut” grade we must also discuss shape. Round brilliant cut diamonds are the most exacting cut which require perfect angles and symmetry to maximize light performance. For all other shapes the GIA grades them on the symmetry and the polish of the stone, but do not give an overall cut rating because there are no exact standards in these fancy shapes. That being said there are certain things to look out for. Marquise and oval diamonds with a poor cut can result in a bow-tie effect in the center of the diamond, which diminishes the brilliance of the stone. Princess cut diamonds can be cut too deeply which results in less brilliance, and you end up paying for weight you will never see. Color: most women do not want to look down at their hand and see a yellowish or brownish diamond so we feel that color is the second most important of the C’s. 75% of the diamonds we sell are in the near colorless (G, H, I) color range, where the diamond is white to the naked eye. D, E and F color grades are the whitest and rarest, yet there is only a subtle difference between an F and a G, especially when the diamond is well cut. For this reason a client looking for a larger diamond can buy a G color diamond and it will look colorless to most people. Some of the best diamond values are found in the faintly tinted (J, K, L) color range. This tint is hard to see in a well cut diamond, and even harder when the stone has faint or medium blue fluorescence. Fluorescence is a property that some diamonds possess wherein the diamond glows when exposed to UV lighting. Sunlight and many other types of indoor lighting have a UV portion which causes the diamond to fluoresce slightly, or glow, when under that light. The best fluorescence is blue because it causes the diamond to appear whiter than its color grade may suggest, and can radically change the look of the stone. One of our number one selling combinations is a diamond that has J color with faint blue fluorescence, resulting in a diamond that is almost indistinguishable from an H-I color stone. For many years fluorescence was simply not mentioned or thought about when buying a diamond but now people are starting to realize it can be a good thing. For years jewelers avoided buying fluorescent stones for fear that they would not be as bright as other diamonds, but this is a non-issue for us because we hand select our diamonds and make sure that they are bright and beautiful. Case in point: a recent study by the GIA showed that the majority of diamond shoppers chose a fluorescent stone in a blind comparison test! Clarity: we have clarity as one of the lower importance C’s because as long as a stone is slightly included (SI) or higher, the naked eye cannot see any imperfections in the diamond- so as long as you purchase a stone that is SI2 (or maybe an I1, see below) or higher, whatever flaws the diamond may have will not impact brilliance or beauty. Our number one selling clarity grades are SI1 and SI2. In these grades any imperfections in the diamond require a 10x magnification to see, meaning that the inclusions are too small to impact brilliance or be seen by the person wearing the diamond. That being said not all SI diamonds are created equally. Some have inclusions in the center of the diamond, while others have them hidden under crown facets, which is more desirable. We make sure to buy the best SI stones out there so that our clients get the best value possible. We also sell many VS1 and VS2 diamonds in which the inclusions are difficult to find even with a 10x loupe. These diamonds are great for clients who want a higher end diamond and are not bothered by slight price increase. The diamonds we sell the least of are VVS and flawless grades. We will occasionally buy these diamonds if they have some redeeming characteristic that justifies the increased price- i.e. awesome cut, unique shape, or if the price is not too high. The honest truth is that there is no eye-visible difference between VVS and SI grades, so unless a client is looking for an investment stone we recommend upping the color or cut grade instead. I would also like to address some common misconceptions about the imperfect grades of I1-I3. Many websites and online forums claim that I1 diamonds have noticeable flaws and are less brilliant, which is not always true. In fact, I have seen many I1 diamonds that are eye-clean but received the I1 grade due to a surface flaw on the girdle of the diamond, or a white feather inclusion that is very hard to see. The clarity grade of “SI3” was created for just such diamonds: where the flaw technically makes the diamond an I1, but it is so well hidden that it looks like an SI2. The reputable grading houses like GIA do not use SI3 as a grade which results in many eye clean diamonds falling into the I1 category. These diamonds represent an awesome value because you can get a bigger, whiter stone for less money. We spend lots of time looking through I1 diamonds to find just such stones. I would however caution clients NOT to buy I2 or I3 stones, as they will have inclusions that start to impact brilliance and durability of the diamond. Carat weight: the least important “c” when evaluating diamond quality is the weight of the stone. It is our belief that a high quality diamond will be beautiful no matter how big it is. Thus the size of the diamond is entirely personal preference, and will not impact the brilliance of the stone. It should be noted that for many people the size of the diamond is the most important factor when buying a ring. We consider any diamond over ½ct to be sizeable. Over 1ct is considered a large diamond, and over 2cts is considered a very rare diamond. Recently I worked with a gentleman who wanted a perfect diamond for their fiancée, so he purchased a .33ct round diamond that was GIA certified as flawless and D color with excellent cut. The price of this diamond was comparable to a round .50ct G SI1, or even a .75ct I SI2. The diamond he chose has that rare blue-white look he wanted, but the .75ct I SI2 would have had a bigger look on the hand. Again, the size really is a matter of personal preference, as both diamonds would be gorgeous in their own right. On the opposite end of the spectrum we frequently work with clients who want a 1ct diamond with a fairly strict budget. If the client is open to different shapes we can find a diamond in an oval or cushion shape that has large dimensions with less weight: thus the client gets a bigger look and pays less. If they want a round diamond we will usually hunt down a well cut SI2 in the I-J color range that has a faint blue fluorescence. The result is a gorgeous diamond at a reduced cost. Finally, we believe in a 5th “C” that most jewelers do not think about: Crystal. The crystalline nature of a diamond refers to the crispness of the diamond material. Some diamonds, no matter how white and free of flaws, have a foggy or dull look. Thus two GIA certified VS2 G diamonds sitting next to each other do not always show the same degree of brilliance and light play. This is one reason that we refuse to buy diamonds sight unseen, even if they have GIA or AGS certification, and it is another reason why the consumer should always see the diamond in person before they make their purchase. We also encourage our clients to view diamonds under our microscope, outside, and in our store. By viewing the diamond in different conditions the buyer will know exactly what their diamond will look like once they get it home, which is essential! To come in and chat diamonds, schedule an appointment here.